Big Data. Analytics. Insights. Machine-learning. IoT… The list of buzzwords touted by HVAC analytic providers goes on-and-on. The HVAC and Smart Building markets are now inundated with buzzwords, but where’s the value? What do these analytics platforms offer that current building automation systems can’t provide? Analytics platforms are 100% proprietary – You own nothing! If you’re a service provider that currently resells mainstream analytics platforms like SkySpark, you don’t own any of the Intellectual Property (IP) you’ve developed – Same goes for customers! Those thousands-upon-thousands of lines of code you’ve written are all contained within a proprietary platform owned by another entity – You’re not an OEM! Meaning if you fail to meet their partner requirements, or even worse they go into default, you’re left with nothing – So much for that six-figure investment! If you’re a customer this cost looks astronomical – “I only spent $40,000 on my platform.” Correct? Well, maybe. The installing provider spent at least $100-200,000 in backend Research-and-Development (R&D) costs to implement his algorithms on your site; Everything from Partner Channel fees, research, development, etc. If they spent less you’re probably not getting proper return on your investment – But who looks at those anyways? Each implementation of SkySpark is based on the providers interpretation of HVAC problems and how the system is supposed to operate efficiently. Unfortunately, most HVAC providers aren’t experts in energy efficiency and often misinterpret efficient operating in lieu of overemphasizing comfort. When payback of these implementations is solely based on discovering issues and providing actionable intelligence, the average implementation fails miserably. Yes, you read that right. There’s no advanced software technology in your SkySpark implementation or your existing building automation system. How can that be possible? SkySpark has yet to release any machine-learning – The most commonly associated buzzword associated with cloud-analytic platforms. So what does it do? Real-time alarms: HVAC alerts based on real-time deviations in equipment operation. For example, your space temperature deviating from its setpoint by more than two-degrees. Not machine-learning. Not AI. Just a simple alarm. This was the same software-technology present in the building automation market since 1980 – Which was more than 30-years ago – Which was before I was born…Barely. SkySpark makes it easier to write these alarms for providers – That’s it. Customers are sold on buzzwords and ‘unicorn benefits’ that are up to the provider to not only provide, but design in their entirety. One of the main reasons these platforms fail to deliver value is that real-time alerts don’t adapt as the design conditions of the building change – Which happens on average at least once every 12-months! Hopefully your subscription was only 6-months! Setup costs are astronomical as customers paying for point licensing, hosting, custom logic, etc. Their overall deliverable is extremely customized with ongoing management considered a ‘grey area’ in HVAC analytics. Customers forced to manage their own systems can expect to pay another $10,000 -$15,000 annually in software-based adjustments just to keep the system functioning properly – But only after they pay another $5,000-$10,000 to send an employee to training. Don’t worry your investment will pay off… One day. Maybe. Let’s be honest, it’s still the Wild Wild West in cloud-based computing for commercial HVAC which should be a giant red-flag for customers who are concerned with payback. Yes, you have SkySpark on all your buildings – Congratulations. The downside is you were sold on the fact you could bid out future developments to multiple providers. This would be like developing an Android App in JAVA and sharing future builds between JAVA developers – There all the same, right? Without any standardization, most implementations lack true actionable intelligence or any other major selling points provided by platform developers. Why? SkySpark relies on HVAC and building automation contractors to deploy their software. The HVAC industry has struggled mightily with software-standards for the last 15-20 years which organically carried over to cloud-platform development. Unless you’re getting all your development done by one contractor, chances are those actionable-insights you’re looking for are being lost in all the ‘big data’ you’ve been collecting – Even worse they probably never existed in the first place! The biggest fallacy in HVAC is that building automation systems adapt with design conditions – You add a tenant and magically the building automation system changes the HVAC unit’s design conditions to maintain perfect comfort and efficiency. This story was invented building automation manufacturers and has been regurgitated hundreds-of-thousands of times across the smart building market to push product – And now it’s progressed into analytic platforms. Managing these analytics platforms is nearly impossible for somebody not skilled in object-oriented programming and in-depth HVAC troubleshooting; A combination that even in the HVAC world encompasses less than 5% of all programmers and technicians. It’s like paying $1,000 to see Ghostbusters without Bill Murray – Seems a little underwhelming! When Googling JAVA I found 135,000,000 results related to software development – Axon (SkySpark’s programming language and engine) returned a whopping 7,000,000 – Mostly pertaining to tasers – Devices that electrocute people in the name of self-defense. Although existing HVAC analytic-platforms may be capable of features like ‘tagging’ or ‘analytics’, most pale in comparison to true object-oriented languages like JAVA or C.
Why choose JAVA over SkySpark? You can use the same User Interface (UI) as SkySpark – It’s based on an API and isn’t platform specific. Subscription services ensure your investment payback never stagnates over time. Providers offering these services ensure continual value either directly by optimizing equipment or indirectly by monitoring and identify cost-saving measures. If not, cancel your contract! Cloud-HVAC platform providers may be gunslingers, but when they’re forced to provide and manage their own solution the investment is more results driven and less capital intensive. As an end user you may not own any Intellectual Property (IP), but you’re also not responsible for guaranteeing massive paybacks from a system you don’t understand. Why not let the experts be the experts while you sit back and reap the benefits! No benefits, cancel the contract! The world of ‘big data’ is still too big for most of the HVAC industry. Although SkySpark might be a good tool for HVAC providers, it delivers little value when placed in the hands of a customer. If you’re still sold on the platform, find a provider that offers a subscription service that includes guaranteed results and isn’t capital intensive – Maybe then you’ll re-coop your investment. Maybe the Browns win the Super Bowl. Anything is possible! I’d like to preface this article by stating that during our research we reached out to every building owner that had vulnerabilities with details of information we discovered – All without cost to them and without the expectation of future work. At no time did we attempt to login or ‘hack’ a building automation system – We simply tested these networks for vulnerabilities easily exploited by hackers. It’s our initiative to secure sites where our HVAC Partners implement our software platform while educating owners of vulnerabilities relating to building automation. In the last article ‘Your building is the next Target for hackers’ we discussed how easy it is to penetrate building automation systems and even new ways to drop a virus payload to the network through open protocols like Bacnet IP. We even found over +300 different buildings with the Bacnet IP port open to the Internet, screaming to get hacked. Didn’t read it? No worries, this article is the one for you, as we explore what happens when your building becomes the target of a hacker! A virus spreads throughout a network like cancer through a body, injecting its code into every file. If somebody attempts to wipe the virus they would have to clean every file. Virus removal is extremely time consuming and challenging as providers have to ensure complete removal or there’s a chance it will re-emerge at a later time. Every lease is different, but in some leases it’s the owner’s responsibility to maintain the building automation. When it becomes the spring-board for a major hack chances are you’re going to get sued. To make matters worse, your Internet Security Insurance Policy won’t cover anything because your existing security didn’t meet minimum requirements – Sorry! Unlike common HVAC issues and comfort calls, network breaches carry much more backlash that stretch the limits of your tenant relationships – Which makes sense figuring you may have cost them hundreds of thousands of dollars. Half of those reading write off articles like this as a “doomsday” scare tactic – The remainder think it will never happen to them. Our advice? Have someone on your staff or a provider search for your building automation system on the Internet and see what you find. If you happen to come across your IP-address you need to hire an IT provider to put your building automation system behind a secure firewall. We researched how hackable building automation systems are in Sacramento and the results are surprising! And just like that your office building is now part of the ‘low-hanging fruit’ every hacker dreams of getting access to. But it’s just your HVAC system. All they can do is turn the temperature up and down, right? Wrong. At least 65% of all building automation systems are connected into existing building infrastructures via hardwired, Ethernet connection. Unfortunately, most offices don’t properly segregate the building automation from the same network as their tenants (Typically done through a VLAN or virtual separation of physically connected networks) as it’s costly to setup and maintain. Meaning a virus enters your network via the building automation and can jump or ‘springboard’ from tenant-to-tenant at will – Return vital information back to its host (Account numbers, logins, credit card numbers, etc.) 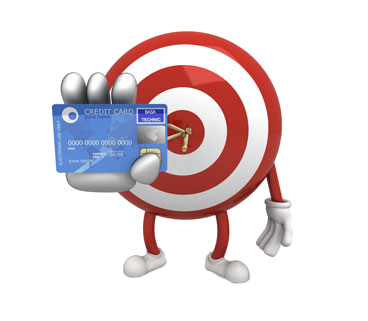 like the Target hack. But you’ve been told your building automation is secure – You’re behind a firewall – It’s only Bacnet – This will never happen to you – Wrong! There are +300-different building automation systems openly exposed to the Internet without a firewall. Of the 82 systems tested, we found 18 had default admin user credentials where there was an ability to login to the automation system and get full access to override the system, change setpoints, schedules, etc. More importantly, admin permissions included unrestricted access to the file transfer protocol features which is pivotal for – You guessed it – Uploading a virus! 114-different building automation systems behind a secure firewall with the Bacnet IP port (UDP:47808) exposed. Despite being open to the Internet, the building automation systems at these sites were nested behind extremely capable firewalls. Unbeknownst to the building owner though, the HVAC contractor had accidently enabled the Bacnet IP traffic on their front-end hardware – Enabling full access to all control setpoints and the ability to springboard viruses onto their network. Wait, I thought Bacnet IP could only be used for HVAC-related data? Wrong again. Bacnet IP is a communication protocol built on the foundation of HVAC communications with one slight caveat – It allows for open file transfer! In developing our Bacnet driver, we discovered that most Bacnet IP-enabled devices will accept a file transferred from our IP-device if it matches a certain criterion of name, type, size, etc. Even when the device rejects the new file, the originator can keep changing file types until one is accepted (i.e. – configuration files, history files, etc.). From there the virus springboards to every connected device on its network – Infecting as many files as possible, collecting information and reporting everything back to the host. So how do you prevent hackers from getting into your network? 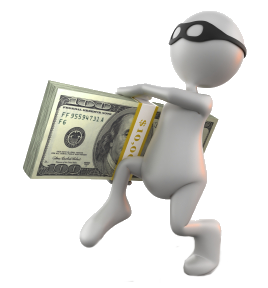 Check out Part: II of this post next week to learn more and see how much it costs to not secure yourself! 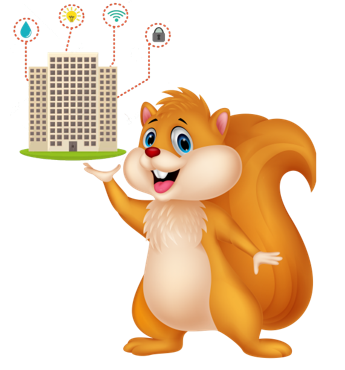 Your building is smart – And so are squirrels! The latest addition to the Smart Buildings market has been the insurgence of smart sensors and HVAC controllers – “IP-enabled” being the core-feature at the forefront of the movement. Because which IP-based devices aren’t smart, right? … I think you get the picture, but how is a smart diaper more intelligent than your IP-sensors? Although IP-enabled devices aren’t exactly cutting-edge, the commercial HVAC market typically lags 8-10 years behind most technology-based industries. There are numerous documented issues surrounding IP in HVAC including security, installation, maintenance, etc. – All leading to it’s snail-paced entrance into the built environment. Not to mention, there’s typically little monetary gain by adding IP-based technology in HVAC as any added value is underutilized by the corresponding software – Which is heavily customized by the installing contractor and relatively unusable/unserviceable post-install without serious re-development. Equipment manufacturers have also leveraged into Smart Buildings by pre-packaging equipment with new onboard sensors and controllers – Each offering new insight into equipment operation and servicing. Unfortunately, analyzing one element in a complex, multi-tiered system lacks the value generation necessary to overcome the added investment. In recent years, many articles have cited onsite engineers noting the only difference between pneumatic, air-controlled HVAC systems and electronic systems is, well, air – Despite the fact that pneumatic technology is +50 years old. Even worse, the same staff didn’t see a difference between building automation and a time clock – So where’s the intelligence? Digging deeper, engineers have exposed the ability to remotely access their HVAC as justification to upgrade from older pneumatic systems. Not a bad start, although it’s the equivalent of using IBM’s new Q quantum computers to surf the web – I don’t see anyone paying $1,000/sec to stream NetFlix anytime soon! Most building automation installations utilize less than 8% of the total system capacity necessary to maximize operational efficiency. Even worse, capacity is often eroded by nearly 40% annually through third-party interaction and modification. Ultimately, your brand new $5.00/sq. ft. “smart” building automation system has less intelligence than the RainBird irrigation system you installed in your backyard – Three years from now it’ll be comparable to a simple light-switch! “Analytics” and “machine-learning” have gained the most notoriety as buzzwords in the HVAC Smart Building space. New platforms emerge monthly that promise to solve all your HVAC problems and alleviate tenant complaints – Of course they’re smart, right? We’ve collectively seen five-different analytics platforms installed in three-different market verticals with zero end user engagement or measurable outcomes – Equating to an extra 25-30% in upfront building automation capital requirements and no monetary gains – How could this happen? Analytics platform developers constantly market the ability to implement cutting-edge, machine-learning algorithms capable of driving massive savings. I have the ability to become an astronaut. It may require 10-years of strenuous physical and mental development, coupled with a 1% chance of success – But who’s to say I don’t have the ability! Furthermore, most platform developers rely on partner channels to develop and implement algorithms designed to drive actionable intelligence to end users. Unfortunately, 75% of all partners don’t employ software developers and rarely have the knowledge to implement anything beyond real-time alarms – Equivalent to the tire pressure alarms in your car. Even in the most advanced implementations, HVAC analytics software deliver little actionable intelligence designed for financial decision-makers. It’s one thing to find a broken part- It’s quite another to validate that incident to a non-technical decision maker. Oh, and here’s a local certified mechanic that specializes in Hondas less than 2-miles away – That’s true actionable, financial intelligence your system lacks! Maybe you choose to ignore the check engine light, but not without significant guilt. Moral of the story, all intelligence isn’t created equal and your platform probably lacks any. How to avoid the pitfalls of “smart” building technology! How does this technology drive my bottom line and does the installer have proven results in a similar application? How do you plan on maintaining the technology post-installation? In house? Outsourced? Can the technology communicate actionable intelligence across my entire corporate hierarchy? 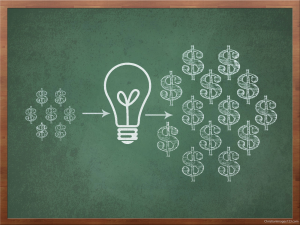 Can the CFO glean valuable HVAC investment insights? 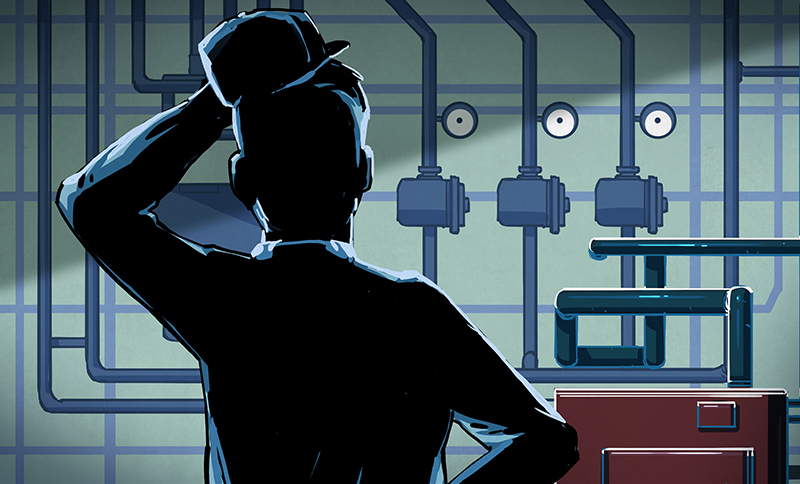 Will your engineers know when and where components are failing? The high-tech landscape of the HVAC market is evolving – Unfortunately marketing has a big head-start on actual technology! https://enerdapt.com/wp-content/uploads/2018/02/SquirrelSmartBuilding.png 370 345 admin http://enerdapt.com/wp-content/uploads/2014/07/EnergyLogoClear-300x193.gif admin2018-02-13 01:03:472018-12-26 22:24:41Your building is smart - And so are squirrels! How many hot or cold calls do you get from a property manager in a month? How many of those calls are software or building automation (BMS) related? How many of your technicians are qualified to work on these systems? Building automation has evolved into the backbone of modern HVAC installations. Sites without control systems are like cars without cruise control – Nearly extinct! 35-55% of all hot and cold calls can either be repaired or identified through the BMS – Drastically reducing repair times and repeat service calls. Unfortunately, most HVAC service providers overlook these systems in lieu of sending a technician to the site. 1. Partner with an automation provider or consultant – For service! Many mechanical service providers currently have 2-3 automation companies they’re partnered with in case of system failures, retrofits or new construction. But what about service? Partnering with an automation provider or consultant allows service providers to screen hot and cold calls before having to send out a technician. If the problem can’t be repaired remotely, your BMS partner is able to suggest potential “next steps” or repairs – Ensuring you get the correct technician for the job. Analytics and fault-diagnostic systems help HVAC service providers and property management by monitoring equipment 24/7 for problems and inefficiencies. The average Preventative Maintenance (PM) contract has a technician onsite for 4-8 hours per quarter – Only 4-8% of the total equipment runtime! Cloud-based platforms proactively find problems like worn valves, stuck dampers, failed thermostats and malfunctioning software – All before they impact tenants. Some analytic systems are even capable of quantifying the issues, helping service providers build business cases around replacing components before they fail. Investing time and money into technicians for training has to have a quick return. Choose at least 1-2 of the most common control systems (Tridium, Johnson Controls, Honeywell or Trane) and invest in training a few of your more “tech-savvy” employees. Cost per class is typically $2-3k, at which time you can obtain licensed software from the manufacturers. 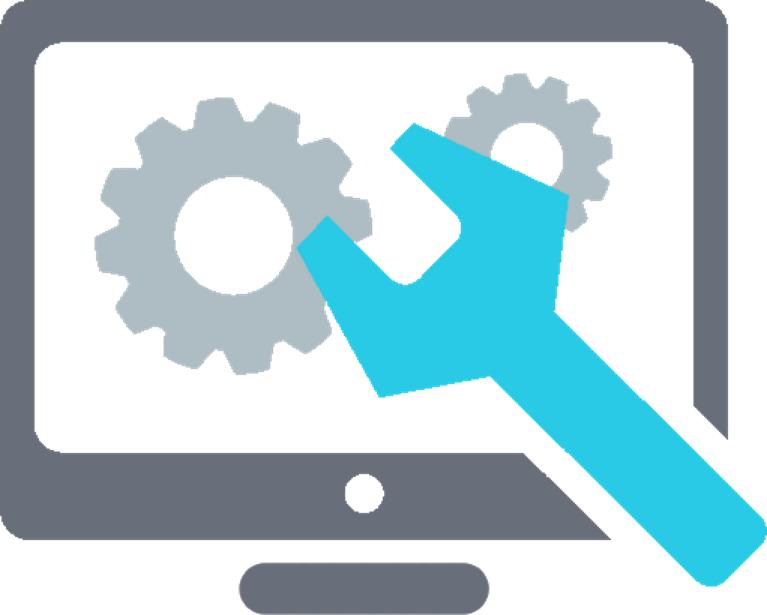 Your newly minted control technicians might not be able to program the latest Title-24 sequences, but they can surely troubleshoot common issues – Equating to quicker response times, fewer repeat issues and higher customer satisfaction. Service providers must understand that building automation is no longer a “glorified time-clock” and these systems play a key role in efficiently identifying and repairing HVAC-related issues. Integrating automation into your HVAC services full-time ensures faster, more targeted responses to common issues. Intelligent buildings are the future but what does “intelligent” actually mean? How do you guarantee savings from smart building technologies? Are all building technologies created equal? 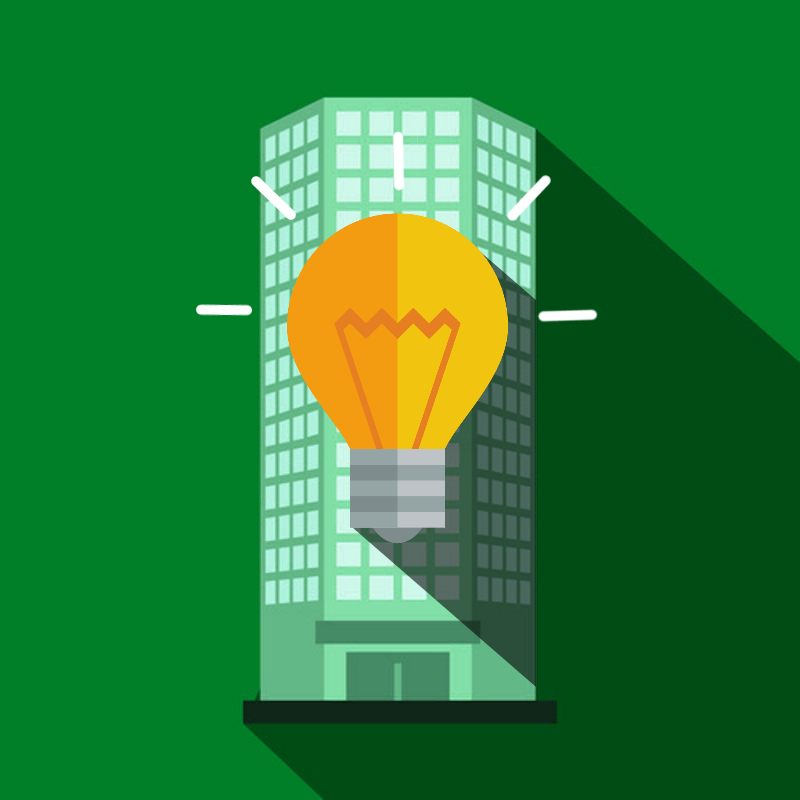 Intelligent buildings are the future – Find out if they should be in yours! Technology has evolved dramatically in the last fifteen years. Cell phones have evolved into “smart phones” and laptops have been replaced with tablets. The last industry anyone would consider being linked to the tech bubble would be HVAC – Laggard, maybe. Left out, certainly not! HVAC technology investments in commercial buildings account for nearly 2.00/sq. ft. and comprise of microprocessors, IP enabled gateways and thousands-of-lines of coding. Intelligent buildings have the ability to network HVAC equipment with the intent to maximize energy savings and reduce maintenance costs. With the building technology market growing larger, some providers are making astronomical claims that may leave your building with a single digit IQ. Building automation systems (BMS) manufacturers argue energy and maintenance cost-savings as a benefit when considering upgrades. Although most systems are capable of substantial reductions the real savings are in the programming or coding – Not the hardware itself! Even configurable systems still require a competent 3rd party programmer or technician for proper setup. The “intelligence” in intelligent buildings typically revolves around the actual coding or programming of the hardware. Imagine Apple releasing the first iPhone without a single App and touting that it will reduce your business overhead by 30%! Although a great platform, even the iPhone would still require talented developers to scratch out code in order to make these lofty claims. When investing in a new intelligent building platform ensure that the 3rd party integrator can guarantee claims made to you by the manufacturer. At least 30-35% of the total cost-savings associated with intelligent buildings are in maintenance and operation. Commercial HVAC operating costs are traditionally 60-70% energy and 30-40% maintenance. Although some HVAC audits omit maintenance savings as part of their returns they have a profound impact on returns. Relying soley on energy savings as justification for an intelligent building can almost double simple payback – Inclusion of maintenance savings can drive payback down to less than 2-years! HVAC service providers capable of interacting with building technologies can reduce total operating costs as much as 21-24% annually – With tenant complaints dropping almost 50%! Make sure your maintenance provider knows how to work with your new system to ensure you hit your savings goals. Intelligent building technologies are often incorporated into sustainable investment strategies – Although they lack sustainability as standalone investments! Systems like building automation and analytics must be constantly maintained and tuned by a certified 3rd party to ensure ongoing savings and efficiency. Investments like building automation should include costs associated with life-cycle maintenance in order to get accurate return data. 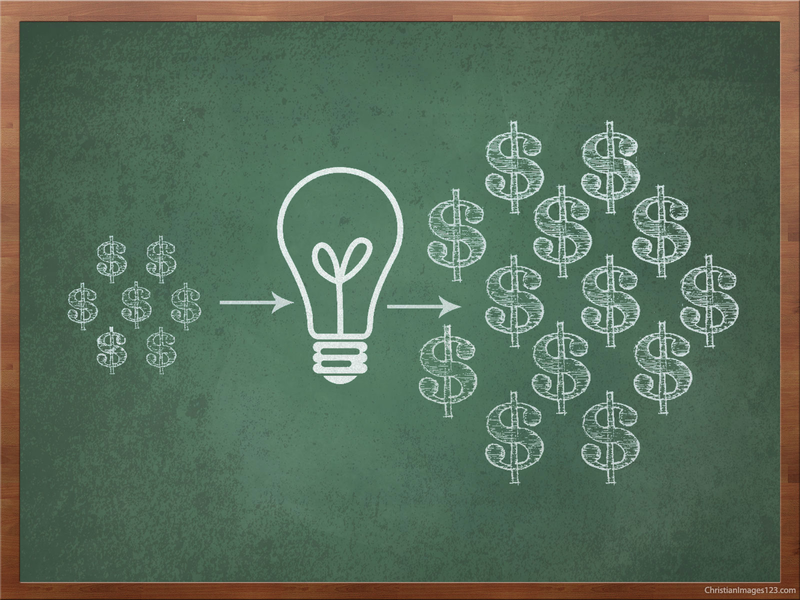 Unlike solar or other energy-based investments, the “one-and-done” mentality can have massive impacts on return calculations. The average HVAC system degrades at a rate of 12-15% annually which must be accounted for with ongoing maintenance and monitoring. Inability to quickly resolve lingering issues leads to high-cost failures and tenant impact. Ensure your service provider includes specific details about maintaining your intelligent building investment – It’s worth it! Understanding and implementing the above ideas on your next intelligent building investment will help safeguard expectations and calculated savings. If you have any questions or ideas on upcoming projects feel free to shoot us a call and one of our engineers will be happy to help! https://enerdapt.com/wp-content/uploads/2016/07/IntelligentBuilding.png 800 800 admin http://enerdapt.com/wp-content/uploads/2014/07/EnergyLogoClear-300x193.gif admin2016-07-18 17:59:092016-07-18 23:55:46Three things to know before investing in an "intelligent building"
The HVAC service industry hasn’t evolved in the last 25-years although equipment has seen massive changes. 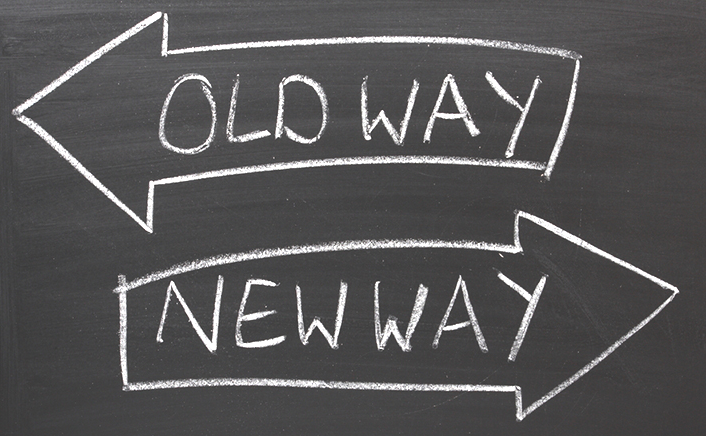 HVAC service is trending towards disruptive changes and here’s why! HVAC equipment has changed drastically in the last 25-years. Technicians are being stretched outside their comfort zones with job requirements similar to that of IT professionals. Owners and managers are finding it harder and harder to differentiate between providers leaving the bottom line as a primary motivator for selection criteria. Even the way equipment is being installed and services has altered with the advent of technology as a driver of efficiency. Building automation (BMS) and “smart units” are enabling service providers to try new approaches to resolving typical temperature issues. Despite HVAC becoming more complex and increasingly efficient, owners and managers are having a harder time differentiating providers. Terms like “value engineering” are now represented by the lowest bidder dropping key design elements to win projects – Irregardless of how those changes impact Total Cost of Ownership (TCO). The influx of new HVAC design and installation firms has also been a key driver. Every year over 11,000 new HVAC contractors enter the market with an average closing rate of 15% – Further adding to market confusion for end users and diluting value. Building automation has undergone massive overhauls in the last 25-years with the adoption of processors equivalent to mobile technology. Almost every piece of equipment in commercial buildings has some form of monitoring or control essential to discovering and ratifying issues. The standard PM contracts doesn’t address technology as a value driver. In fact, it hasn’t changed since equipment ran on air-driven controllers – Controllers that aren’t electronic! This means that 45-50% of all issues reported by your tenants can be identified and repaired remotely without ever seeing a technician. “Virtual service” or monitoring-based contracts are beneficial for both parties as they lower customer costs, contractor overhead, and repair times. The Millenials and generational technology gaps haven’t been kind to the HVAC industry. Established technicians are finding it hard to transition into psuedo-programmer roles necessary to properly maintain equipment and supporting technology. Building owners and tenants are suffering the cost-impact of repeat HVAC issues from inaccurately conceived solutions as technicians fail to find the root of software-related problems. Even worse, Millenials are choosing white-collar technology jobs over blue-collar labor like HVAC and construction. The labor pool of HVAC technicians is not only worsening, it’s also shrinking! What changes can we expect to see? Technology has been the primary driver in the evolution of HVAC standards. Yet, most service providers are choosing to combat labor shortages and skill deficiencies with price wars instead of innovation. Adopting new technologies to supplant physical presence for service opens up new opportunities for maintenance contracts and new hire criteria. Maintenance contracts based around remote monitoring and repair not only reduce overhead, they allow providers to choose from a new labor pool – One predisposed to technology that can be taught HVAC fundamentals! Be forewarned, the HVAC installation and service landscape is headed for major disruptive changes beneficial to both building owners and contractors! How much do you actually get for your HVAC preventative maintenance? Are you able to measure the savings versus not having a service contract at all? What can you do to start reducing HVAC related tenant complaints and get a handle on your energy bills? Evolving your HVAC service contracts to curb complaints and high energy bills! Preventative maintenance was originally designed to reduce emergency failures and ultimately HVAC related tenant calls. Most studies conclude that there are 12-15% maintenance savings in preventative over reactive service from proper inspection and upkeep of units – Much like maintaining a car! As with HVAC service, we take our car in for oil changes at least once a year and have the added value of a mechanic checking other components to see if they’re failed. Or, at least that’s what we like to believe. The reality is that we settle on the $19.95 oil change, drive away with brakes worn to the rotor, and get angry that the “mechanic” forgets to put back the oil plug. Why do we risk so much? Without understanding the actual risk of brake failure or how much you save with every oil change, preventative maintenance is like buying insurance – We only know the value when something goes wrong! Until then, we’ll settle on the cheapest provider. Technicians do visual and auditory inspection at least 6-8 hours per quarter. This means technicians are only onsite 8/660 hours per quarter – Or 1% of the total operating time of the building. How much can actually be accomplished in that amount of time? The extent of preventative maintenance you’re actually paying for is equivalent to a SpeeDee oil change! Technicians barely have enough time to replace filters, oil units and maybe check on a few lingering issues. Altogether, they’re missing about 55-60% of potential failures that directly lead to your tenants’ being impacted! Using service to reduce tenant complaints and energy costs – Finding a solution! The solution isn’t finding a new service provider or increasing existing contract amounts, it’s utilizing existing building technology to increase proactive management and realize savings. With the advancements in building technology like automation and 24/7 monitoring managers can now get actionable data straight from the building without needing to extend existing service contracts. You still need somebody onsite for some visual and auditory analysis, but most buildings have the technology to notify managers about impending problems before they affect tenants. The true value of preventative maintenance is finding and repairing issues before they lead to tenant impact and higher energy bills. Emerging building technologies are able to predict and quantify failures before they occur giving you the ability to prioritize repairs as an investment rather than cost impact – At a fraction of the cost of traditional onsite service! Managers and owners can now utilize technology to manage HVAC costs and budget upgrades in order to become proactive instead of reactive with their investments. Replacing and upgrading HVAC has been traditionally based on outdated methods that could be hurting tenants and your bottom line! Strategies for investments in HVAC like maintenance, upgrades and replacements are evolving beyond visual inspection and estimated industry life. We’ve all been told that once your car odometer flips 200k it’s time to start looking for a new car. Based on industry research, large parts like engines and transmissions begin to wear down and the risk of catastrophic failure increases exponentially – Or at least that’s what you believe. 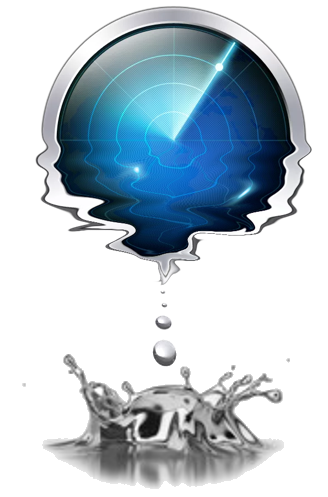 We live in a world of information, yet traditionally, most has been inaccessible or lacked actionable-intelligence until now. Think about how investments in our car would transform if next time you went in for an oil change your mechanic told you the total operating cost savings of replacing air filters or changing belts? You’d probably be more inclined to dip into your piggy bank knowing there was a 2-3 month timeline for return. What if instead of just real-time MPG, cars showed you MPG degradation over time? Even more, cars tracked maintenance and gas bills to show your total cost of ownership and how efficiently you operated and maintained the vehicle? You would begin thinkinng about replacing your car based on metrics like Return on Investment (ROI) and risk of parts failures (Excluding the leasing crowd) rather than industry averages and routine inspections. Like cars, HVAC wears down over time. But the difference is HVAC equipment contains the data necessary to establish operating degradation and deliver actionable-intelligence on when, how, and why you should invest. Owners and managers have traditionally relied on tenant complaints, energy bills and industry standards as actionable metrics to drive HVAC upgrades and replacements. All of which amounts to less-than-educated guesses and utilizes risk aversion as a basis for investment – And nobody like spending money on insurance! So how do you accurately budget equipment replacements without risking tenant comfort or usable life? 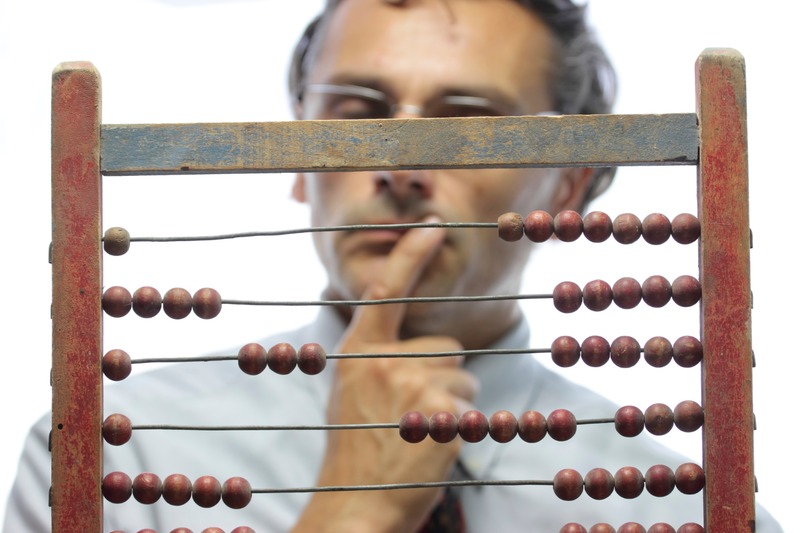 Start by evaluating investments based on the two most commonly used metrics – Risk and return. If you pair real-time equipment forecasting and tracking to traditional replacement methodologies you can increase equipment life 12-15%, mitigate risk of failure, and guarantee savings. Understanding HVAC operating costs starts with tracking and forecasting operating costs over time, yielding operating degradation. Example – 1: As your equipment ages over time it begins to degrade in total operating costs like maintenance and energy. Degradation forces operating costs to exceed equipment value over time, inducing owners to upgrade units and measure impact on how it curbs operating costs. In Example – 1 we see that as equipment ages over time it degrades to the point were operating costs like maintenance and energy surpass Replacement Asset Value (RAV). 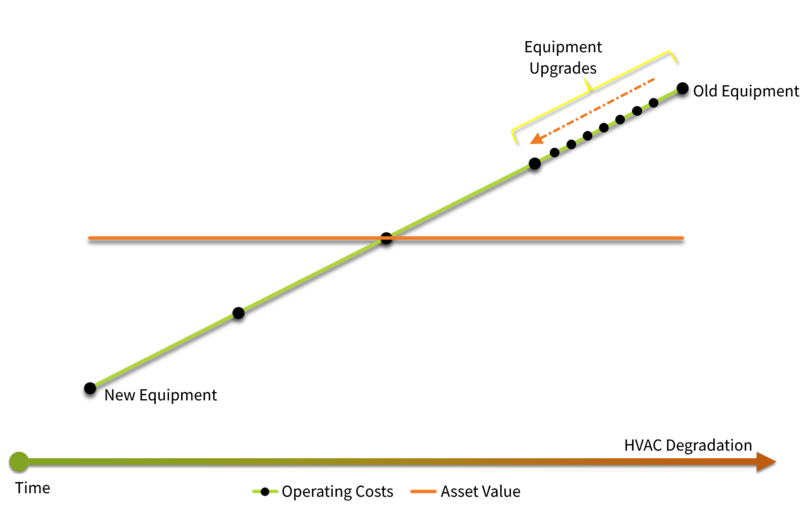 When managers can see degradation in real-time, they can decide when to proactively invest in upgrading units and measure success based on how much operating cost degradation is curbed post-project. 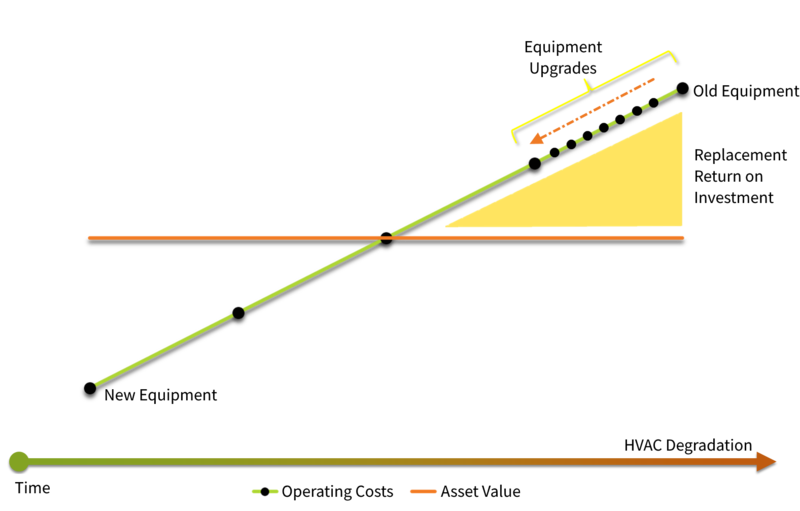 Example – 2: As operating cost degradation exceeds asset value over time we find that a replacement Return on Investment (ROI) can be tracked. If we invest in equipment and see no change to the ROI we know the next actionable step is to replace the equipment. What happens when you upgrade a unit with a VFD, or replace a valve, and there is no measurable effect to degradation? Further exploring equipment degradation in Example – 2 shows us that once operating costs surpass Replacement Asset Value (RAV) a Replacement Return on Investment (RROI) is revealed. If real-time ROI isn’t impacted by equipment upgrades, it’s a good indication the unit has aged should be replaced. Forecasting and tracking equipment costs like energy and maintenance are essential to understanding how effectively you invest in HVAC – From basic maintenance to capital replacements. Without adequate risk and return data you could be replacing equipment too early and upgrading too late, all of which is impacting your bottom line and tenants! Three ideas property managers can use to drive sustainability in their buildings – Without spending a fortune! Property managers have more knowledge than they might be aware of to greatly reduce building operating costs without tapping into capital reserves. Large commercial real estate companies typically have sustainability and engineering divisions tasked with finding building inefficiencies throughout their commercial portfolios. When we think building sustainability, our minds drift to sophisticated solutions involving key stakeholders and large capital budgets. Yet, when it comes to HVAC, it may be easier than you think to drive down energy and maintenance costs with little capital. There’s one person that knows the building and it’s issues better than anyone – The property manager. 6/10 tenant issues reported to property managers are HVAC related – 60% of all energy in a commercial building goes to the HVAC… Spotting a trend? Maintenance is usually tracked as an annual lump sum with the Preventative Maintenance (PM) contract broken out. Like most analytics, lump sum only tells us that you’re spending more or less – Not where, how or why you’re spending your money. If you track maintenance costs at the equipment level (valve replacements, filter replacements, etc. ), the resulting annualized figure can be used to reveal operating degradation. Dividing annual maintenance costs by total replacement value gives you an indication of equipment Return on Investment (ROI) from a maintenance perspective. A resulting ROI of 0.15 or lower indicates your equipment is working efficiently while 0.3-0.4 tells you it’s time to replace. Driving equipment replacements from maintenance degradation extends life 10-15%, reduces emergency replacement costs 20-30% and often leads to lower energy costs from increased efficiency. There are a few new building technology services capable of tapping into your buildings HVAC and finding potential failures before they occur – Some even go as far to quantify the issue real-time for easy repair prioritization. Forecasted maintenance services are typically subscription based, granting managers the flexibility to evaluate cost savings without large capital expenditures. Systems should evaluate issues from a financial perspective allowing managers to acclimate new, actionable data into their workflows without needing a strong technical background. Finding and repairing issues before the equipment fails not only alleviates the potential risk of failure and tenant impact, it reduces maintenance costs 25-35% and increases equipment efficiency 15-20%. 50-60% of HVAC related tenant calls in commercial buildings are building automation related. Preventative Maintenance (PM) contracts often fail to identify and remedy automation inefficiencies before they impact your tenants and your energy bills. Typical issues like hot/cold calls and “doors blowing open” often refer to the controllability of the Building Management System (BMS). Having a controls contractor or consultant audit your system and tune up programming periodically throughout the year can often solve the major issues your tenants have discovered. Fixing simplistic automation issues often result in 10-15% savings, payback in less than 8-months and extended equipment life. The above recommendations have a proven track record of great payback (<8-months average) and can be easily implemented by property managers – Without needing to brush up on technical skills. Try them out today and feel free to leave comments on how well they’ve worked for your organization! https://enerdapt.com/wp-content/uploads/2016/06/Sustainability.png 1200 1600 admin http://enerdapt.com/wp-content/uploads/2014/07/EnergyLogoClear-300x193.gif admin2016-06-01 22:40:582016-07-11 21:26:04Three ideas property managers can use to drive sustainability in their buildings - Without spending a fortune!